During your medical consultation, Dr. Reddy will be able to find the cause of your dark circles around your eyes and provide you with a personalised treatment. Dr Reddy says: “Your doctor is correct to be reluctant in treating the delicate under-eye area, as there are numerous potential complications especially if the injections are not administered by an extremely experienced cosmetic doctor. It is possible to have filler placed in the hollows underneath your eyes in the tear trough region, in order to rejuvenate this area. This is a very delicate treatment that requires very special blunt cannulas to ensure that any damage to the tiny blood vessels is avoided. To ensure the results are both effective and natural, it is essential to couple this technique with a conservative amount of filler. Dr Reddy says “There are two issues that can cause prominent tear troughs. The first one is volume loss within the frontal cheek pad, which causes a depression just below the eye. The loss of volume results in the formation of shadows below the eyes. Occasionally, a high quality reflective makeup can sometimes reduce the appearance of these shadows, but not always. The second problem is the thinning of the skin, which can lead to puffiness as a result of water retention. These two problems need to be addressed individually. The tear trough condition can be corrected with a cheek volumisation procedure to help restore the volume of the front cheek pads. I would then combine this procedure with an energy-based skin tightening procedure, such as radio frequency, or a skin peel to address the loose skin. Volume restoration with a dermal filler will last between 6 to 12 months. There are a number of quick, safe and effective ways of improving this delicate area and they are offered at very competitive prices at Medi-Sculpt, usually starting at R5000. Question: “I’ve always used eye creams, but I can’t seem to get rid of the puffiness underneath my eyes. I’m wondering if I should switch to an eye serum or a gel. I’m confused about what the different products do. Dr Reddy says “As we get older, gravity becomes our biggest enemy. It fights us every step of the way, and eventually we have no choice but to give in. Our skin seems to be affected the most. It starts to droop and sag right in front of our eyes, not to mention underneath them. 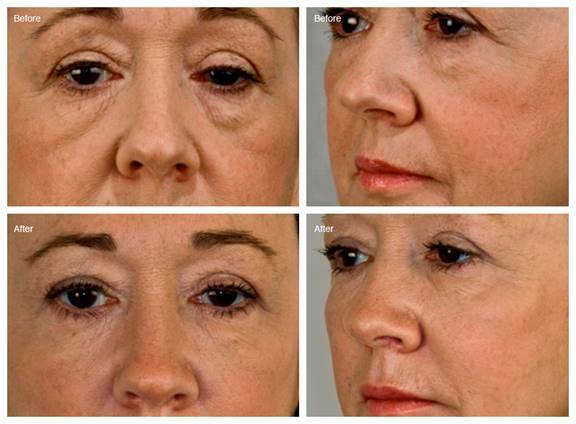 Bags underneath the eyes are a common and inevitable sign of ageing. During our youth, healthy skin and muscles do their best to hold fat back, but as we get older, they start to lose that battle and we end up with puffy bags outlining our eyes. Puffiness, bags and dark circles can change the look of your whole face, making you look tired and drawn. There are a few other causes of under-the-eye bags. It could have something to do with your diet, lack of exercise, the way you sleep and whether or not you have allergies. Depending on what’s causing your bags, you might be able to get rid of them. If they’re the result of getting older, you only have a few options – and they all involve needles or scalpels. If your bags are just puffiness, you might be able to get rid of them by simply changing your lifestyle. In some cases, it appears that the more sleep you get, the puffier your eyes seem to be. As the skin around the eyes is very sensitive and delicate, it’s important to take care of it with appropriate products. Puffiness under the eyes can be due to a number of causes — one of the most common being increased water retention. You could try minimise your salt intake and try sleep on different pillows to see if it helps. In terms of products, the difference between eye creams, serums, and gels lies in their formulations and the active ingredients they contain. Creams tend to be heavy and sit on the surface of the skin. Gels often have higher water content, which may not be ideal if the main issue is puffiness. Serums are lighter formulations, which tend to absorb quickly and penetrate deeper. An eye serum would most likely suit you best if puffiness is your main concern.